Brown (shoulder) has been placed on injured reserve, Scott Petrak of the Elyria Chronicle-Telegram reports. Analysis: Brown's designation comes in conjunction with the return of cornerback Terrance Mitchell, who's been placed on the 53-man roster following October surgery to mend his broken wrist. Brown will finish his rookie season having played 39 snaps (13 offensive) across two games. 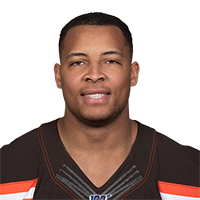 Brown is questionable for Sunday's game versus the Panthers with a shoulder injury, Mary Kay Cabot of The Cleveland Plain Dealer reports. Analysis: Brown was added to the injury report Friday as a limited practice participant with the shoulder issue. The 24-year-old has been on the roster since being promoted from the practice squad in late October, though he has yet to be active on gameday. There are no videos available for Pharaoh Brown. Click here to view all videos.